The symmetry of the house underpinned the design for this garden. 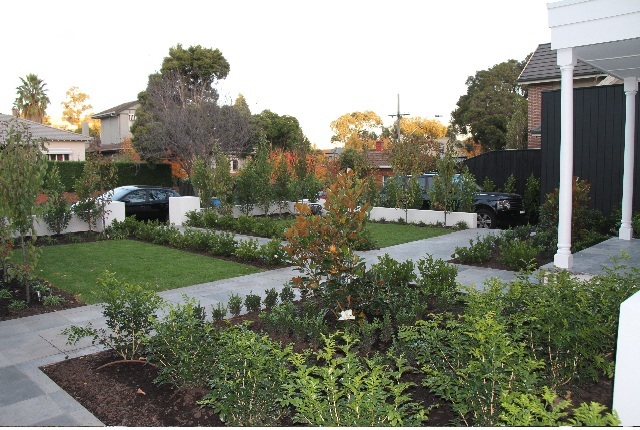 My design sketches started with a generous central path leading from the street to the front door and a secondary path leading from the driveway to the side entrance – this then created the spaces for planting. Along with symmetry my main goal was that my garden design needed to look equally good from the outside framing the facade as it did from the inside looking out. The property had a convenant that the front fence must be no higher than 760mm so I therefore opted to have a hedge of Ficus Flash, which in time will provide a solid screen between the street and house. For continuity the Ficus Flash is used for all perimeter planting. The Ficus Flash is also planted between the driveway and main garden. This again in time will provide a solid screen between the hard surface of the driveway and the outlook from the windows of the two front rooms. From the front facade the ficus also softens the hard element of the modern black garage box and also successfully ties the modern garage with the period facade through consistent planting. In the main garden I have then planted a layer of Ornamental Pears as ‘feature’ trees which will grow higher than the Ficus hedge providing further screening and a seasonal difference in the garden. I particularly love the Autumn colours and Spring blossom. The pears are underplanted with white flowering Liriope. A row of Gardenias line the central path and border the grass. The two garden beds under the two front windows are identical, continuing the symmetry of the garden and provide a lovely outlook for the two front rooms. A thick hedge of Murraya sits under the windows. When these are in flower the perfume is incredible and with the front windows open the scent will float through the house, along with providing a lovely perfumed entrance and a lovely lush green outlook from the two front windows. Little Gem is used as a feature tree in the centre of the remaining garden bed and are bordered by two layers of English Box. In time the Little Gem will grow taller and provide further scale to the very tall front facade along with ‘sitting’ nicely either side of the entrance. The overall result is a beautiful, balanced, symmetrical garden that compliments the facade, provides a lovely entrance to the home and softens the hard element of the modern garage box. The garden also provides privacy from the street and an equally beautiful ‘view’ from the inside looking out from the front rooms.